'You are a donkey!' or 'Don't act like donkey'-an often used phrased in India and I believe honorable citizens of India might have heard or used it. At the point of exasperation, these phrases used to extract your frustration out. I am glad I am exception to this and do not use it since long time. I refrain to use these words on anybody. May I confess, I am afraid to use this sentence on any living creatures including the creature under discussion-the donkey! If necessity is mother of all inventions than compulsions is father of all convictions! I developed this conviction not to call anybody 'Gadha!' (Donkey) way back when I was just 10 years old. The compulsions was the 'Donkey's day' I faced which is still fresh in my mind. I was 10 yrs then living in Jamnagar, a small city of Gujarat, a western province of India. My father was Professor and we lived in Professor's colony of Jamnagar Ayurvedic College. We had wonderful surrounding at the colony. The colony consists of two rows of 10 houses, each measuring roughly 700sq ft. There were twenty families residing in that colony .By average standard on those days, a family had five children. That makes 100 children in age group of 5 to 20 yrs. with us. I had a group of 5 boys of my age and forming our 'Toli' (group). Our colony had a road, which bisected the colony into two. On outer sides of the colony were the bushes stretching all around to about 1km.And this bushes were our playing field where we nourished our childhood and still cherish sweet memories. 'Donkey' rides were very common among us. It was our privilege, thanks to the 'khumbar' (donkey owner, usually called in Gujarat) who used to let their donkeys stray in the bushes. We learned the 'tricks' to get hold of stray donkey. Our elders had, over period of time, taught us how to get hold of Donkey, how to tie a rope around the neck or even pass it through the nose, how to make 'saddle' from broken pillows and ropes, how to get on to donkey, how to start him up, what ways to turn the ears of donkey to make him move other way, how to make him run fast by putting 'fabricated' wooden and rounded sticks in the 'appropriate places' etc .Riding donkey is an art. I call it art because it needed something extra to do. I would say you need an art to ride a donkey. Donkeys are not used to somebody riding on them, the way Horses are used to. 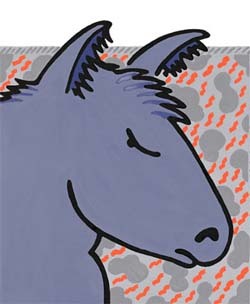 More-ever Donkeys do not like riders the way horses like it. Our seniors gave us 'mock' practices, before being 'qualified' for 'independent' rides. It was matter of great pride and honor for us to be qualified for donkey ride. Donkey rides were feasible during certain periods. During afternoon times, it is easy to catch and control them. During these times, they go for nap or are lazily grazing. Soon after we would leave the school, we walk down the narrow lanes, which would lead to our colony area into the bushes. While walking down home, we would look around in bushes and open field for stray donkey. If any of the donkeys sighted, the 'programme' for 'ride' is fixed. It was well-organized event for us wherein everybody's scope of responsibility was fixed. One was given responsibility to bring in ropes, other told to bring the 'saddle', etc. After lunch, our parents used to prefer sleep. They often stopped us from going out in afternoon and us the children would not sleep and would like to play. Contrasting requirement would be fulfilled by the small 700sft. House with two room and kitchen. The parents could not sleep if we are in the house. Hence, for formality sake we were often told not to go out of home in the afternoon. By now, our senses have developed enough to understand the parent's requirement v/s our needs. We were clear about the limits to cross and where not to cross. After all, we were not Donkeys! The ride started smoothly but was not supposed to be for long time. As we moved on pedestrian roads of the bushes, my sixth sense alarmed me of something dangerous to happen. I started feeling uncomfortable. I slowly smell the donkey feeling the same. The up-down and sideway jerks become in consistent. Therefore, my heart beats. The donkey started shaking a head for a while. To cover up my fears I shouted at my escorts 'Barabar pakadna gadho! Kahi yeh pattha daga na deve' (hold him properly, this crook may deceive!). My escorts did nod in confirmations however; I could see them tired and their grip on the donkey getting loose. I was the not the only one to see that. Hence, abruptly the donkey gave a forwarded lap that left my front escorts out of control. Warning bell has rung for me and I swung both my arms around the donkey's neck! By now, my front escorts were on ground and the back escorts a little distance away. Donkey started running and my fears match pace with him! I turned around my neck to see my escorts merging in bush background. My grip around the neck of donkey tightened. My instinct assured me of everything to be safe so long as my grip around his neck is strong. By now, Donkey had started dictating his terms. He swirl his neck in order to get rid of my grip. However, I dint oblige him. He ran to about 100m distance swinging back legs in air to the horizon to over-topple me. But, again, I dint oblige. I was still there on his back wondering how dreadful a donkey can be! My survival instincts churning out all thoughts and even advising me to jump from the donkey's back and leave the angry donkey to his fancies. But the very thought of falling down on land and breaking bones frightened me. Despite that I made two attempts to jump .But this time donkey dint oblige me and gave a vertical jerk just enough to make my arms grip stronger around his neck!. Game of wits had already begun between a human and donkey. As I followed my instincts, so did donkey! He made a sudden move, which left me surprised. He moved away from the Pedestrian road and headed towards the bushes. At first, I thought I overpowered him mentally and that out of frustration he is moving into bushes, literally surrendering! But he had his wits working well for him, which I realize when I felt the thorns of bushes scratching my hands, legs and the back! For a second, my grips become loose. He started giving me jerks upwards and sideways and I could feel thorns of the bushes ripping into my skin! Yet my instinct said 'no' to idea of jumping out of running donkey's back. I was worried 'what would happen if I fall into such thorny bushes and hurt myself all over the body'. Spilt second decision was made and eventually, despite all thorns brushing me, I hold my grip tight and waited for the donkey's resilience and mercy. Slowly his movements and jerks become slow and started moving straight. I gave a sigh of relief and pride ran all through out my thorny wounds. Next thought cropped up 'how to get rid from this donkey? He was slowly moving out of the bushes and coming towards the plains. I decided to wait and watch. I dint wanted to think 'donkey way' in bushes! But, well, it was Donkey's day finally! As the open plain approach, I gave a sigh of relief, as thorns did not prick me now. By the time I could relax, I saw my dreadful donkey changing course and moving towards our colony's big 'drain and human waste' tank and soak way pits area. I knew that area was full of overspill human waste and drain. As determined soldier, my donkey took speed and darted towards the Tank and Soak way Pit's area. In no time, we were in the human waste and drain spill area. Donkey stopped right in the middle of all filth. And the final battle of wits began! Now was the time to prove who real 'donkey' was! The donkey was still and that gave me motivation to jump and get rid of horrendous ordeal. But the site below on ground of human waste repelled my Idea. Secondly, I was worried that, if I get down, donkey would dart on me a give me memorable blow. I recollected how one of our elders was given a donkey bites and the social humiliation and medical care thereafter. The donkey did not move at all. He was either checking my patience or probably leaving me with options to go. By now, I was overpowered by the smell of the spill. Nevertheless, I dint loose heart. I started stroking, jabbing and finally beating donkey at all places I could reach, to make him move away from the spill area. However, he dint oblige. I wanted to reach to his back where lay the key of 'accelerations'. But that would leave me with one hand to grip his neck. Risk factor was high on donkey with loose grip. I was taken by surprise earlier by the honorable soul so-many times by now. I gave up the idea of reaching to his back. Time went on and perspiration soaked me in. By now, I have lost to Donkey in wits and patience. Where on hell do anyone loose to donkey in wits? And here I was who has surrendered his wits to a donkey! Ultimately, I decided to acknowledge the defeat and its consequences. I felt deeply sorry for myself. I gradually came down from the donkeys back. The ordeal was finally finished. I looked at the donkey when I got down. He looked calm but looked at me like a lion leaving prey scot-free in jungle! I could see and sense his pride and his galore. He stared at me and, as if like a mark of victory, 'roared' the donkey's roar. I could see a large laughter in his roar. I believed he was telling the whole world, the nature and the God 'Hey look! I have made this man 'donkey' today!' It was insulting moments for me. I thought, I had better move from this place before the donkey finishes his victorious mood and vengeance creep in. Leg deeply soaked in human waste; I took long leaps until I finally came out of the spill area. To add injury, by now, my holy escorts have reached the scene. They looked at me the most merciful way, which, one will not even dare even for a dying man. The next moment they broke into laughter. As I slowly tread away from the scene with my escorts, I turned around and looked at the donkey. He had become salient by now but was directly staring at me. I could not bear it anymore. I turned my face and started pacing up with my friends back home. I felt very uncomfortable but my inner self went on. I remember the way I used to call others very often ' 'you are donkey'. Then came the final blow from my inner soul. Those were the prophet's words for me. I got the bottom message. Since then, I started respecting the donkeys. I stopped 'mis-using' their name. Moreover, if somebody 'mis-used' on me, I gave them big smile! For I knew, it is his turn now to go through the 'donkey ordeal' .If one want to understands from my experience it is good. Or else let him go through the ordeal what I went through once. And be assured the rest of the life he would really understand what donkey is.